EPA Administrator Scott Pruitt is the most corrupt administrator in the history of the EPA. Since taking office in 2017, he has spent hundreds of thousands of taxpayer dollars on luxury travel, absurd security measures and countless expensive perks for himself and his friends. In his first year alone, Scott Pruitt spent nearly $200,000 on travel. American taxpayers funded Pruitt’s stays in pricey hotels, his first-class airfares and his trips on military aircraft and charter flights, domestically and abroad. In response to this alarming spending, the Office of Inspector General agreed to audit the “frequency, cost and extent of the Administrator’s travel” to determine possible fraud, waste and abuse. 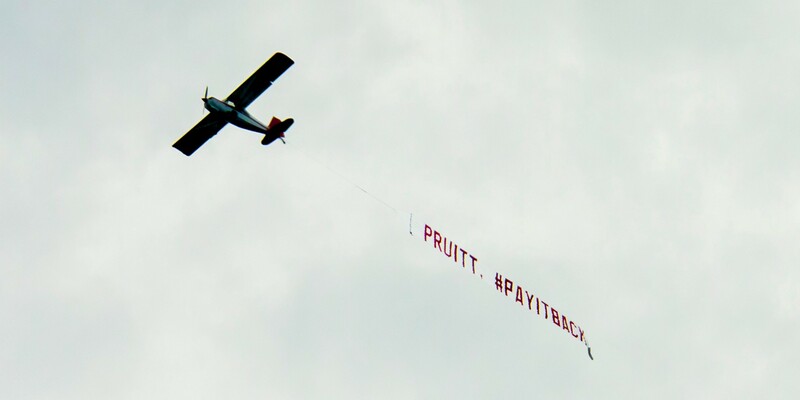 Friends of the Earth hired a plane to call out Pruitt’s use of taxpayer money on luxurious travel, October 2017. In a sign that congressional Republicans are also losing patience with Pruitt, House Oversight Committee Chairman Trey Gowdy sent numerous letters requesting information to see if Pruitt followed federal regulations. This became “the first Republican-led investigation of a Trump administration cabinet member.” The inquiry initially focused on Pruitt’s official travel expenses, but was later expanded to include other ethics and legal concerns. Pruitt did not help his own case when the EPA failed to produce all the requested documents in time. According to agency sources and documents, Pruitt’s “swollen security detail blew through overtime budgets and at times diverted officers away from investigating environmental crimes.” The OIG is reviewing whether appropriated funds were allowed to be used for Pruitt’s security expenditures and whether the EPA complied with applicable oversight controls. When asked about his unprecedented 24/7 security detail in a congressional hearing, Pruitt read aloud threats made against him from a document he falsely claimed was from the OIG. However, new reporting shows that Pruitt sought round-the-clock security from day one, casting doubt on whether he had actually faced serious threats before expanding his security detail. In addition to the previously mentioned OIG review of Pruitt’s security spending, an entirely separate investigation was launched after it was revealed that Pruitt was using official EPA security for family outings. Sen. Sheldon Whitehouse sent a letter to the OIG noting that Pruitt was using his taxpayer-funded security detail on personal trips to Disneyland, the Rose Bowl and college basketball games. The OIG responded that it would open a new inquiry. This OIG audit will examine the EPA Office of Criminal Enforcement, Forensics and Training’s law enforcement availability pay reporting. Based on concerns identified in the audit of Pruitt’s security expenditures, the OIG decided to take a closer look at whether employees were properly recording their hours in compliance with federal requirements and EPA policies and procedures. In December 2017, the OIG agreed to review Pruitt’s construction of a “secure, soundproof communications booth.” Even though two other secure spaces already existed in EPA offices, Pruitt testified to Congress that he did not find them satisfactory because the spaces were “not that close” to his office. When Rep. Peter Welch questioned the purchase during a hearing, Pruitt blamed “career EPA officials” for making expenditures that he did not approve. After the Government Accountability Office also began to review the installation of the booth, the OIG ended its redundant investigation. The GAO concluded that the installation of the soundproof phone booth was illegal. The $43,238.68 booth violated two federal laws — (1) Section 710 of the Financial Services and General Government Appropriations Act, 2017, which requires that agencies notify Congress for expenditures of more than $5,000, and (2) the Antideficiency Act, which prohibits agencies from spending more than Congress permits in appropriations. However, in an obvious attempt to undermine the scientific integrity of the EPA, Pruitt has dismissed credible scientific advisers, forced out others with underhanded changes to membership criteria and aimed to fill these important advisory committees with industry representatives. He has also implemented a devious new policy banning scientists that have received EPA grants from advisory positions. Considering the agency is one of the top funders of environmental science in the country, this action would keep the most qualified researchers from sharing their expertise with policymakers. In 2017, Pruitt leased a Washington, D.C. condominium for $50 a night from the wife of the head of the lobbying firm Williams & Jensen. While he was renting the condo, the EPA issued a letter explaining that it had no serious environmental objections to an oil pipeline expansion for Enbridge, Inc., a client of Williams & Jensen. Enbridge was previously required to pay the second-largest fine in the history of the Clean Water Act for a spill that sent hundreds of thousands of gallons of crude oil into Michigan waterways. Since Pruitt paid below-market rent, his questionable housing arrangement could be considered an illegal gift that came from interested sources. The situation also likely violated the Impartiality Rule because of the appearance of a conflict of interest. Additionally, the acting director of the Office of Government Ethics raised concerns over possible violations of the Standards of Ethical Conduct for Employees of the Executive Branch. The matter eventually made its way to the OIG for review. 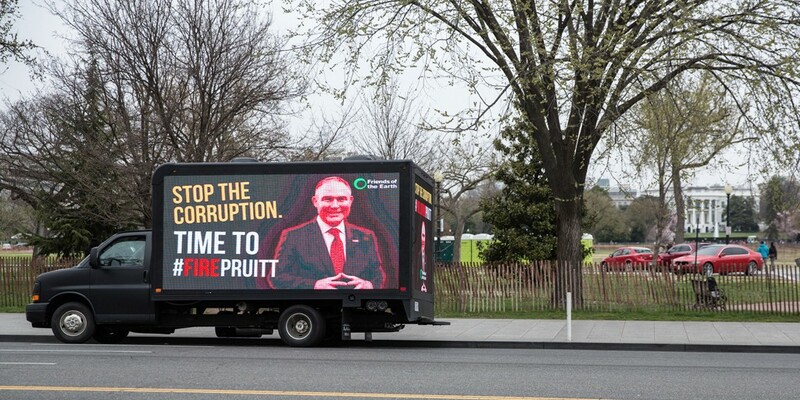 Friends of the Earth drove a digital billboard to the White House highlighting Pruitt’s condo scandal, April 2018. A White House official disclosed that the White House is conducting a review of Pruitt’s activities following the scandal around his below-market rental. Press Secretary Sarah Huckabee Sanders later confirmed the existence of the internal investigation. Pruitt is reported to have used the Safe Drinking Water Act to bypass the White House’s rejection of his request to give substantial raises to two of his favorite aides, Sarah Greenwalt and Millan Hupp, who came with him from Oklahoma. Pruitt also used the Act to sidestep Trump’s ethics pledge (prohibiting federal officials from working on issues on which they had lobbied in the previous two years) in order to hire long-time chemical industry lobbyist Nancy Beck as deputy head of the Office of Chemical Safety and Pollution Prevention. The OIG released a management alert, or official notice, in April 2018 to provide information on salary increases for Pruitt’s staff while it continues to examine how the agency has used (or abused) its authority under the Safe Drinking Water Act. Pruitt appeared in an August 2017 National Cattlemen’s Beef Association video opposing the Waters of the United States rule, which was “designed to clarify federal agencies’ authority and give them the power to regulate small waterways…for pollution prevention.” The video urges farmers and ranchers to support a repeal of the WOTUS rule due to “regulatory overreach.” Pruitt’s participation in the video is blatantly problematic. The EPA is “prohibited by appropriations legislation from using its resources to… fund propaganda.” The GAO is therefore examining whether Pruitt violated appropriations laws and the Antideficiency Act. 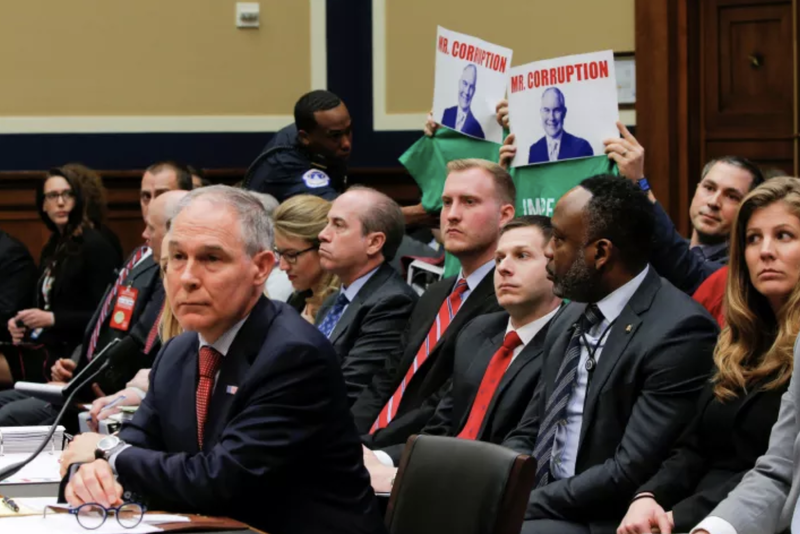 Friends of the Earth called out Pruitt’s corruption at a Congressional hearing, April 2018. After coordinating with the OIG, the GAO stated that “it could and would use that factual record regarding that meeting to conduct its analysis.” As with the National Cattlemen’s Beef Association video, the investigation will determine whether Pruitt violated appropriations laws, specifically those that prohibit lobbying by executive branch officials, and the Antideficiency Act.